An Indonesian handcrafted sculpture intricately constructed using ethically sourced cowrie shells from the Indian Ocean with taupe cotton. Mounted on a discreet rustic black stand. A truly unique objet. This Cowrie Tribal Shell Necklace is a large Indonesian ceremonial necklace from New Guinea. It is made up of two rows of white Cowrie Shells attached to a base of beige braided rope. Each Shell is, approximately, 7 to 10cm long. The necklace is 33cm wide and 40cm high, and is finished with a beige rope loop and a circular wood toggle. 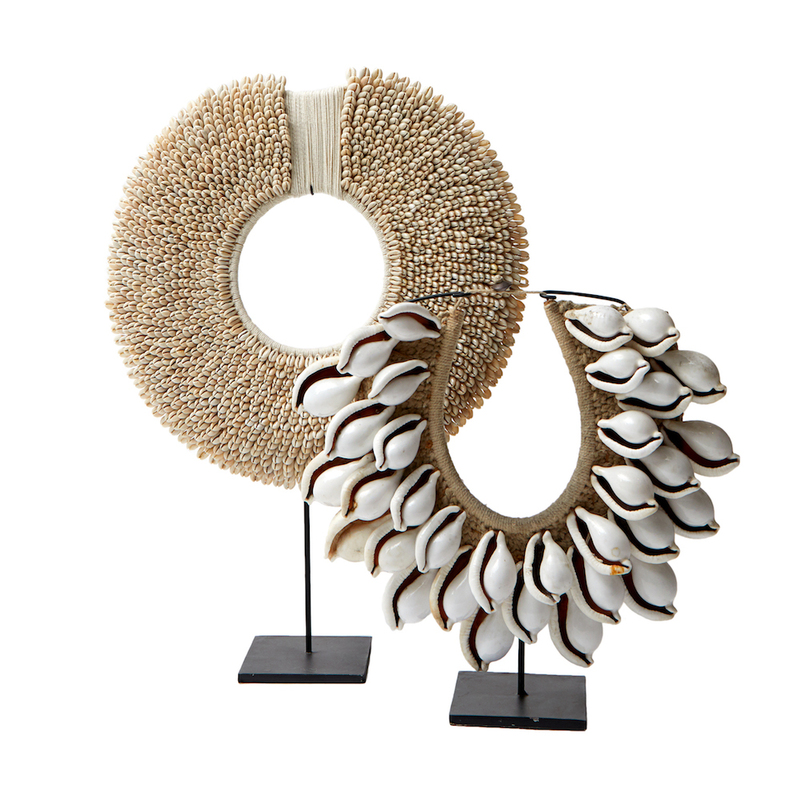 These beautiful tribal shell necklaces are not only used to create the unique form of Oceanic Art. They are “Tabu” a form of Tolai Shell Money. Tabu played a very important part in the life of Tolai villagers being used for settling disputes, bartering for produce, as part of the traditional ‘bride price’ as well as being regarded as a symbol of prestige, and along with goods and cash was the customary method of acquiring land.